I thought in this post for Wedding Chapel Wednesday I’d talk about pre-1900 Hawaii Marriage Records. If you’ve done any research in Hawaii for records before 1900, you know that it’s difficult to find vital records. While recording of events was mandatory before 1900, consistency didn’t exist until around 1910. When dealing with marriage records before 1900, there is a good chance you will not find a marriage certificate. The marriage register books for that area are all that exist. When ordering a certificate from the Dept. of Health for a record prior to 1910, chances are you will get a typed certificate with the details taken directly from the register books. If you want a “real” marriage certificate, chances are you’re only going to find it at the church level. But, is that all there is? In looking through the State Archives website, I came “Vital Statistics Collection, 1826-1929 (Molokai, Niihau, Kauai, and portions of Maui)”. Further research showed that some of the marriage records included in this collection are not marriage certificates, but marriage licenses. This may be why these records still exist. While the certificates were issued at the local level, these copies of the licenses were sent to the Territorial Treasurer. That gave them a better chance of survival. I do not know if the State Archives has marriage license records for other islands. If they do, I hope they will eventually add them to the online digital collection. 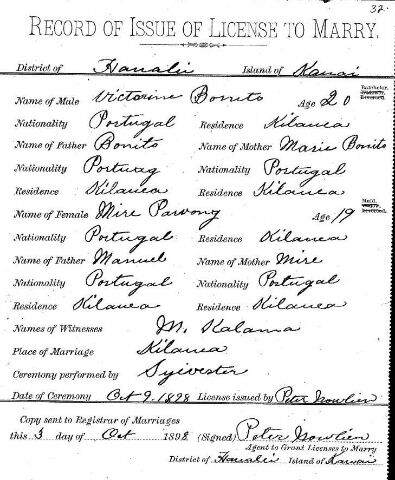 This is the marriage license for Victorino Bonito and Rosa Maria Pavao (her name is badly mangled!) Victorino was the son of Manoel Antonio Bonito and Maria Jacintha. Rosa Maria was the daughter of Manoel Rocha Pavao and Maria Jacintha Vierra. You can see that parental information is skimpy. Victorino’s Father was only given a last name, while Rosa Maria’s parents were given first names only. This marriage took place in Kilauea and was performed by Father Sylvester. Because of the location, I assume it was at Kilauea Catholic Church, a.k.a. St. Sylvester’s Church. There is one thing I found curious about this license to marry. The ceremony was performed on 9 Oct 1898, but the document says that a copy of the license was sent to the Registrar of Marriages 3 Oct 1898. I don’t fully understand the procedure, so I have to assume that one of the dates is in error, or they record this page for their own records, filling in the marriage details after the marriage ceremony was performed. It’s still going to be challenging to find a pre-1900 marriage record. But, at least there are a few places to look. You can see that finding a record with a names and dates will be next to impossible. For those early records, you need to know the island–the town is even better! So, don’t give up if you’re working with Hawaii. New sources become available all the time. If you keep at you, you may eventually find what you need.